For my 3-year-old son, CJ, pedaling a bicycle does not come easy. I don’t know if he is just lazy, or lacks the core strength that most kids his age have. But thanks to his Strider No-pedal balance bike, CJ is riding around the cul-de-sac near our home right along with his older sister and the other neighborhood kids. Strider No-pedal balance bikes are designed to help children of all ages learn balance and coordination before pedaling. If your child can walk he can ride a Strider. The simple, no-pedal design allows even the youngest children to learn to ride on two wheels, avoiding tricycle tip-overs and training wheel wobbles and instilling considerable confidence and bike handling skills sure to last a lifetime. My two-year-old can also ride the Strider bike with ease. 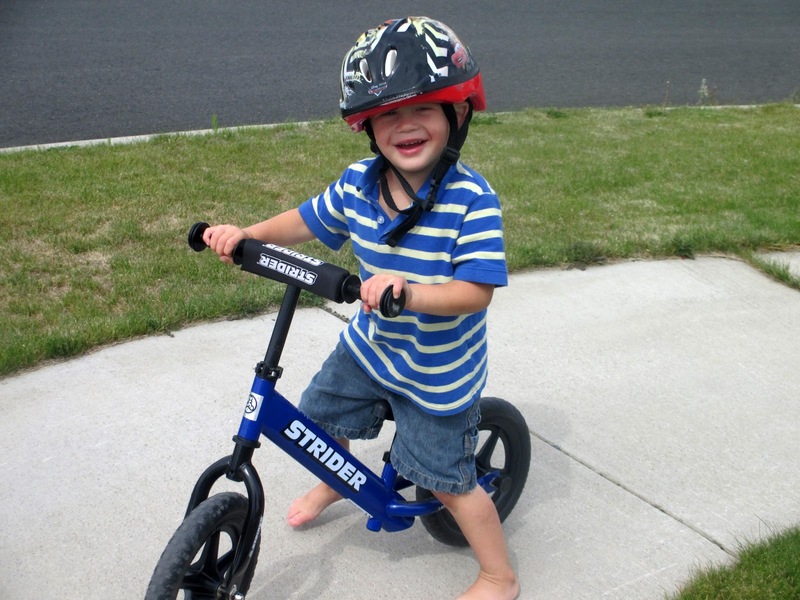 Strider No-pedal balance bikes are also designed for kids with special needs in mind. The seat and handle bars are simple to adjust to suit your child’s unique size and abilities. This video explains it in more detail. Strider bikes come with a detailed instruction manual and are simple to put together. It took me less than 10 minutes to assemble CJ’s Strider. For more information on Strider No-pedal balance bikes and to locate a retailer near you visit StriderBikes.com. *Disclosure: I received a Strider No-pedal balance bike in exchange for this review. All opinions are accurate and 100% mine. One lucky Healthy Moms Magazine reader can win a Strider No-pedal balance bike. All you need to do is like Strider on Facebook, Follow Strider on Twitter, follow Strider on Pinterest and leave us a comment in order to enter. For every entry including extra entries please leave a separate comment. Winners will be chosen randomly from the comments and e mails that I receive. The contest ends on July 26, 2013 at 3pm PST and is open to anyone in the US, 18+. Please leave your e mail address in your comments. All comments without e mail addresses will be disqualified. I like Strider on Facebook (Andrea Hamilton). I'm following Strider on twitter (@andreacouponz). I follow Strider on Pinterest (Andrea Hamilton – davandi). I'm following you on twitter (@andreacouponz). Thanks for the awesome giveaway! Would love to win this for my little guy. I follow Strider on Facebook, Twitter, and Pinterest.